We get a few things chucked over the wall into the Vicarage garden – mostly it’s stray footballs and wrappers from fast food that greet us on the rare occasions we venture into the borders with gloves and trugs. But yesterday I spotted something a little more unexpected as we spent a day with a few friends from theological college. I gazed out of the window as we were chatting and saw A DOG. Since our garden is fenced in pretty well, this is not something we’ve encountered before. And you’d think someone would have missed the poor thing. So we went out and found a rather smelly, but quite friendly hound, who’d obviously been sleeping under a tree. It may have been there for a day or two, although the Vicar thinks he would have spotted it when chopping wood yesterday. And although the garden gates were open for a while, it seems more likely that someone had sent the poor animal over our wall. He had no collar on. We called a couple of doggy local friends to see if they recognised it but nobody did. So then we called Sandwell Council’s out of hours dog warden. Who was with us in less than an hour. He told us that our canine visitor was about 4 years old and not microchipped. Then the warden popped him on a lead whilst he wolfed down some dog food that the Queen had run out to buy for him. He seemed like a very sweet even-tempered dog, and I might have been tempted to keep him if I hadn’t known that the Vicarage cat would object outrageously. 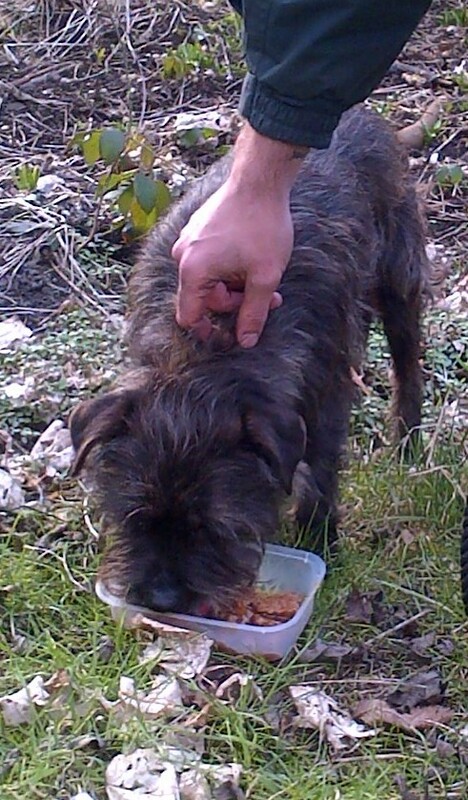 So he’s been taken to City Dogs Home in Stoke – they’ve not got his pic up yet, but we’re going to keep an eye on it and give them a call to see how he’s doing. They take 7 days to check them out before starting the rehoming process. It’s sad to think someone abandoned him, and a bit annoying that they were so cheeky as to leave him in our garden, but we were impressed with the warden and the system which enabled him to be taken care of so quickly.